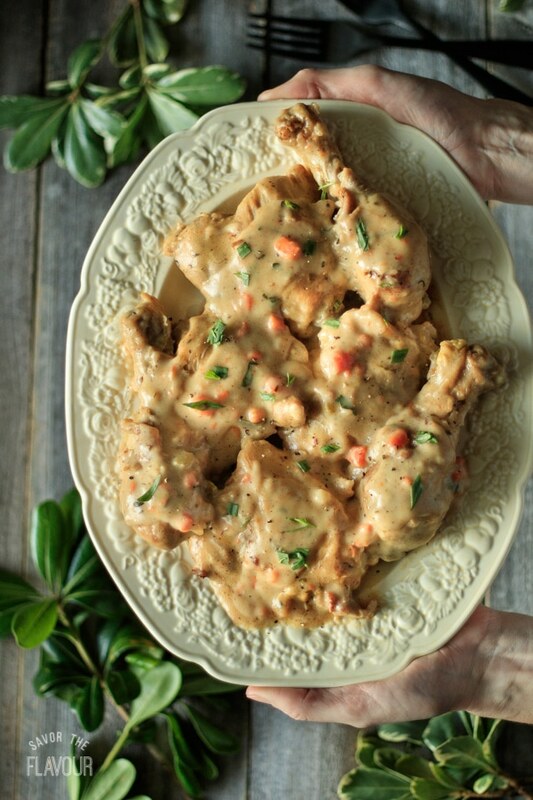 Classic chicken fricassee is a French country comfort food that your family will love for dinner tonight! 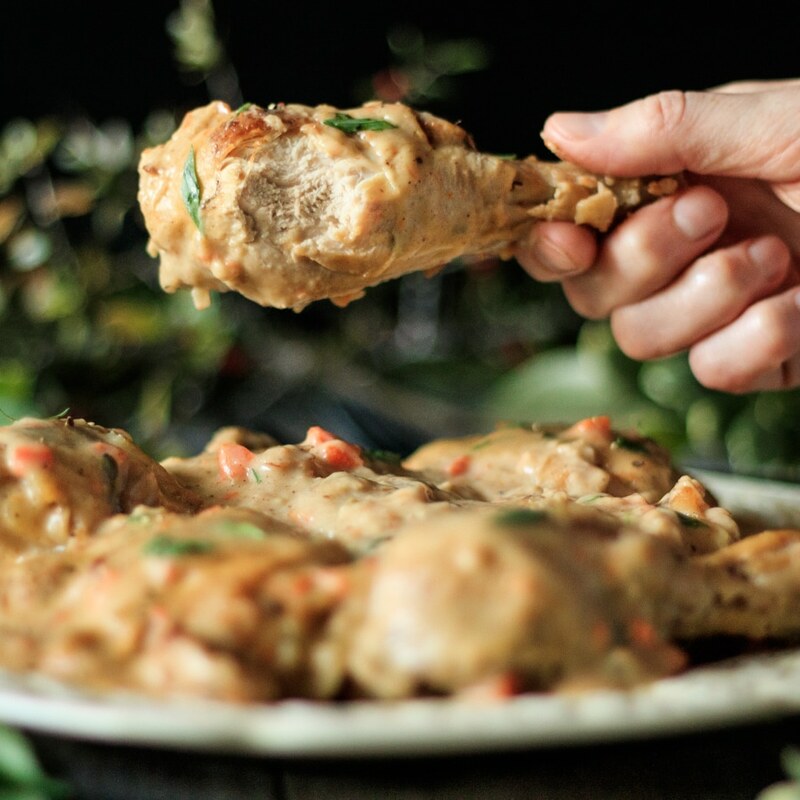 This low carb main course recipe shows you how to cook perfectly juicy bone in chicken thighs and drumsticks and make a yummy lemon and tarragon gravy. 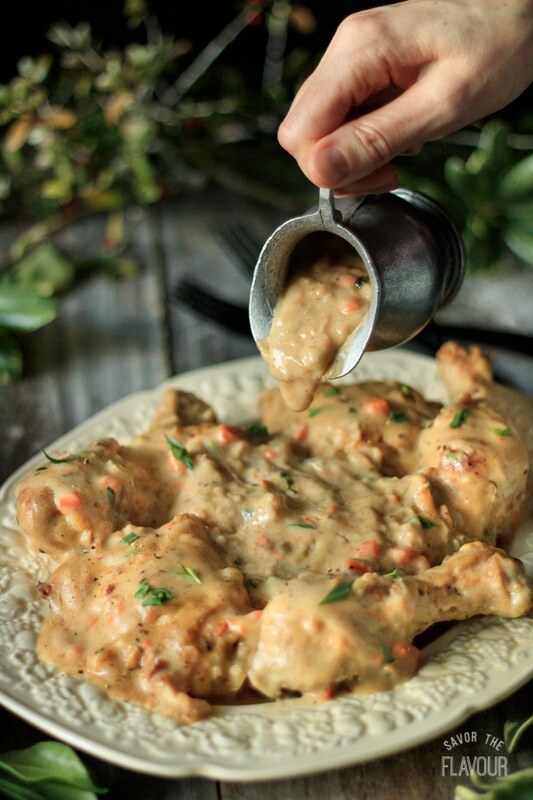 Classic chicken fricassee is a French comfort food that is really welcoming during the cold winter months. There are many variations to this dish, so feel free to add your own twist. This recipe is great when you feel inspired to cook, as it uses many valuable techniques like searing, sauteing, making a roux, deglazing, braising, reducing, and tempering. If you aren’t familiar with these terms, don’t let them scare you. Take a deep breath, and dive right in to the wonderful world of French cooking. To sear the chicken, use two heavy-bottomed pots. Over medium-high heat, preheat the pots, then add the oil and butter. Rinse and pat dry the chicken pieces. Season with salt and pepper, then put the drumsticks in one pot, and the thighs in the other, skin side down. It’s important not to overcrowd the pot and to put them in a single layer. Fry the chicken until a golden brown, turning once, then put on a large plate. Aim for 5 minutes per side. Saute the diced veggies in the two pots. I used the traditional trio of onion, carrot, and celery, better known as mirepoix. Turn the heat down to medium and scrape up the brown bits or drippings on the bottom of the pan using a wooden turner. Cook them until they’re a caramel, golden brown color, which will take roughly 8 minutes. Stir occasionally. To make the roux, which will help thicken the sauce, sprinkle flour over the veggies and cook until the flour is absorbed, roughly a minute. Deglaze the pot, by pouring in the wine (red or white). Let it boil and thicken which takes only a minute. Scrape up any remaining brown bits off the bottom of the pot with a wooden turner. Slowly whisk in the chicken stock. To braise the chicken, return the drumsticks and thighs to the two pots. Gather up some of fresh thyme, parsley, and a bay leaf and tie together with kitchen string to make a bouquet garni for each pot. Bring the pots to a boil, then reduce to a simmer, partially covered. It’s important not to submerge the chicken in the stock; 1 to 1 1/2 inches of liquid is all you need. Cook the chicken for 25 to 30 minutes, then place the chicken on a large plate. Reduce the liquid by simmering it uncovered for 5 minutes, or until the sauce coats the back of a wooden spoon. Remove the bouquet garni. To further thicken the sauce, whisk the room temperature egg yolks with the cream. Have two bowls–one for each pot. This thickening agent is called a liaison. Temper the liaison by adding 1/2 cup of the hot cooking liquid, one tablespoon at a time, while constantly whisking. Do this for both bowls. Once the liaison is tempered, stir one bowl into each pot. For the finishing touch, add freshly chopped tarragon, and freshly squeezed lemon juice to taste. Gently stir. Return the chicken to each pot and let it heat through for a few minutes. Put some of the sauce in a gravy boat. Serve warm with the gravy. 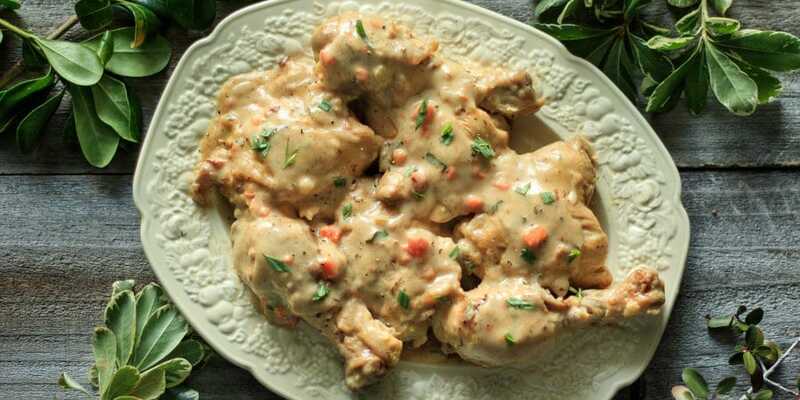 This dish is traditionally made with a cut up whole chicken minus the wing tips and backs. For a finishing touch at the very end, try using fresh chopped herbs, lemon zest, a splash of vinegar, or a dollop of crème fraîche. You can serve this dish over rice, mashed potatoes, or egg noodles. I prefer to eat it plain with just the sauce poured over top. If you are making this dish for children, you might want to cut the meat off the bones and pour the sauce over top before serving. You will have leftover gravy. Keep this to use on another day over whipped potatoes. If you want a thicker sauce, add more flour to the roux in step #3 and or let it reduce longer as in step #6.